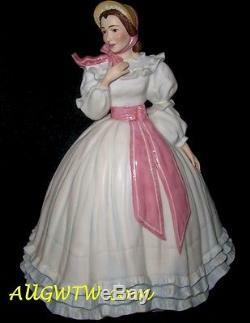 This beautiful hand painted porcelain figurine is of Melanie Wilkes from the movie Gone With The Wind. She stands 11 tall and is in excellent unboxed condition with no cracks or chips. In 1988, the Franklin Mint made 4 large porcelain figurines of the main cast members; Scarlett, Rhett, Ashley and Melanie. The figurine depicts Olivia DeHavilland as the beautiful and demure Melanie. She is shown dressed in her dove grey blue chiffon ruffled dress with matching bonnet with pink trim, just as she was at the 12 Oaks BBQ. Not long after this figurine was made Ms. DeHavilland withdrew her permission for any items to be produced with her likeness. Since then, "Melanie" items have been highly collectible, especially since Olivia just celebrated her 100th birthday! Please ask all questions before purchasing. We are clearing out our remaining GWTW inventory, so all sales are final. The item "MELANIE WILKES Figurine Gone With the Wind 11 Porcelain 1988 by Franklin Mint" is in sale since Monday, July 11, 2016. This item is in the category "Collectibles\Decorative Collectibles\Decorative Collectible Brands\Franklin Mint\Figurines". The seller is "allgwtw" and is located in Newnan, Georgia. This item can be shipped to United States, Canada, United Kingdom, Denmark, Romania, Slovakia, Bulgaria, Czech republic, Finland, Hungary, Latvia, Lithuania, Malta, Estonia, Australia, Greece, Portugal, Cyprus, Slovenia, Japan, China, Sweden, South Korea, Indonesia, Taiwan, Thailand, Belgium, France, Hong Kong, Ireland, Netherlands, Poland, Spain, Italy, Germany, Austria, Israel, Mexico, New Zealand, Philippines, Singapore, Switzerland, Norway, Saudi arabia, Ukraine, United arab emirates, Qatar, Kuwait, Bahrain, Croatia, Malaysia, Chile, Colombia, Costa rica, Dominican republic, Panama, Trinidad and tobago, Guatemala, El salvador, Honduras, Jamaica, Antigua and barbuda, Aruba, Belize, Dominica, Grenada, Saint kitts and nevis, Saint lucia, Montserrat, Turks and caicos islands, Barbados, Bangladesh, Bermuda, Brunei darussalam, Bolivia, Ecuador, Egypt, French guiana, Guernsey, Gibraltar, Guadeloupe, Iceland, Jersey, Jordan, Cambodia, Cayman islands, Liechtenstein, Sri lanka, Luxembourg, Monaco, Macao, Martinique, Maldives, Nicaragua, Oman, Pakistan, Paraguay, Reunion.